Description: This nudibranch has a complex pattern of red markings on the head and body. 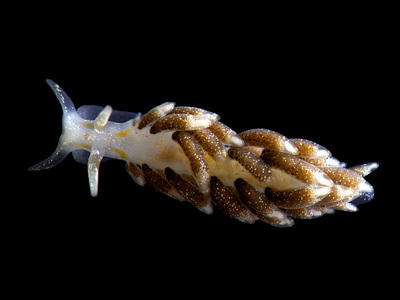 There are red rings on the oral tentacles and rhinophores, crescent-shaped red marks running longitudinally in front of and behind the rhinophore bases, and a red v-shaped mark behind the heart in the centre of the back. The body and cerata are flecked with spots of yellowish-white pigment, which becomes almost continuous on the front of the head, and forms rings below the tips of the pointed cerata. Typically 10mm in length. 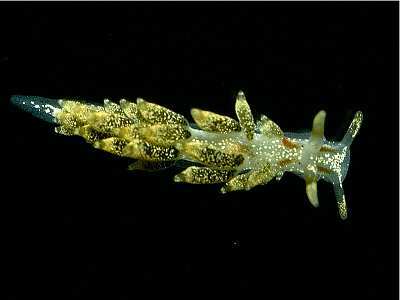 Habitat: This species seems to have a wider choice of hydroid food than most other Trinchesia species. It has certainly been shown to eat Obelia species and Halecium species, and occurs beneath loose stones on the shore as well as in the sublittoral. Distribution: Widespread in the British Isles, with records from the Faeroes and Norway. Mediterranean records have recently been shown to be the similar species Trinchesia genovae. Similar Species: The markings on the head distinguish this species from other Trinchesia species apart from T. genovae; the exact shape of the markings distinguish the latter. Five red markings in the head/heart region. Cerata and body with golden flecks of pigment. Picton, B.E. & Morrow, C.C. (2016). Trinchesia foliata (Forbes & Goodsir, 1839). [In] Encyclopedia of Marine Life of Britain and Ireland.